I’m still writing! I’m almost to 40,000 words. I’m rewriting a previous story, and I’m at the point where the previous stuff is not working, so I’m having to write new stuff. I hope this new version is better, but at this point I can’t tell for sure. All I know is that the old stuff didn’t work anymore. For those of you who are writing, how’s it going? Are you still passionate about your story? Maybe that’s what’s slowing me down – I’m not feeling that urge to write. But I’m writing anyway! Anyone who thinks writing isn’t work should try it for a while, right? Good luck to all of you! And if you’re behind, don’t give up! Your story needs you! Hey you writers out there! How’s it going so far? Have you been writing every day? Did the prep help? What are you struggling with? Remember, the goal is to write. Hitting your target number, writing every day, doing word sprints – those are just tools. Find your own style and make it work for you. Good luck! The book you are writing is better than you think it is. The book you are writing is more important than the next book. 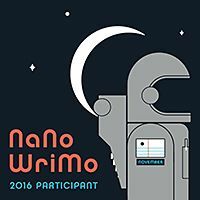 NaNo Prep #1 – Are You In? This is the first in a series of articles I will be doing about prepping for NaNoWriMo, or National Novel Writing Month. Hey, fellow writers! Next month is NaNoWriMo, and whether you’re a first timer or a repeat, there’s one question you have to ask yourself LONG before November 1st if you want to be a success. Are you in – as in – are you committed? Are you in this project for the long haul? Are you going to write every day, right up until November 30th? This really matters, because if you’re just casually committed to your book, you’re not going to finish it. Hey, you don’t HAVE to write a book. But if you want to write, you need to really want it. That’s been my problem lately. I’m kinda half-hearted about writing. I want to finish my book, but I want to finish my other projects too. So for the month of November, I’m committing to writing every day, for at least 30 minutes a day. If that means leaving the house so I can use a computer, then that’s what I’m going to do. I’m going to the library, or getting on my tablet, or using a freaking notepad and a pencil. But I’m going to write. What about you? Are you going to stick with it, even when you feel like you have nothing to say that day and you really want to go do something else? If you really will write every single day, you can absolutely hit 50,000 words by the end of the month. You can finish. We’ll do it together.